Clairvoyance – Exactly What Is It? Clairvoyance has a long history of anecdotal evidence going back to pre history. It seems to have been used specifically by the Shamanic or religious elements of society rather than being generally available to the populace for ‘mundane’ use. This can be a difficult subject to grasp immediately because the term has so many different meanings. So, first of all, let’s go through these definitions in order that we know what we are talking about. Clairvoyance literally means ‘clear vision’ and is derived from 17th C French. It’s most general definition is ‘the means to gather information about an object, person, location or physical event through means other than the known human senses. It is a form of extra sensory perception (ESP). Parapsychology has a definite and more specific meaning for Clairvoyance. That is ‘the transfer of information that is both contemporary to and hidden from, the clairvoyant’. Do not mix this up with telepathy. Clairvoyance gains information from an external source while telepathy gains information directly from another mind. Clairvoyance, in general use, has a varied meaning which depends on the speaker and the context in which it is used. It can refer to the perception of past events (retrocognition), of future events (precognition) and of present but remote events. 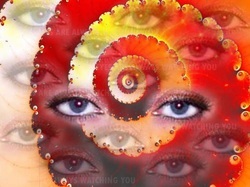 Clairvoyance can also, depending on context, mean remote viewing. It is certainly a related subject but remember, remote viewing refers to a specific controlled process and may not be automatically termed Clairvoyance. Clairvoyance can also refer to communication with the dead and as such can be termed mediumship. In general, the term Clairvoyance has become a catch all for any sort of extra sensory perception and as such, is at the whim of fashion. In fact, present day preference is to use the term ESP or psychic, which, to modern ears, have more authoritative resonance and hence are taken more seriously. The term Clairvoyance itself is gradually being relegated to that of a catch all for odd ball and probably fake practices. Clairvoyance, meaning mediumship, can be generally regarded as a sub set of the larger Clairsensing. That is, Clairsensing consists of Clairvoyance (seeing), Clairaudience (hearing), Clairsentience (feeling/touching), Clairalience (smelling), Claircognizance (knowing), Clairgustance (tasting) plus a number of other ‘abilities’ that do not fit neatly into any category. The Clairvoyant, in the Medium sense, often uses Trance in order to receive data external from the Clairvoyant. When Trance is used, the external data is assumed to come from other entities, incarnate or discarnate and can be independent from time. Clairvoyance, again in the Mediumistic sense, also includes other abilities or effects that do not fit neatly into any of the above channels. This is due to the term Clairvoyance being used carelessly as a ‘catch all’ as explained above. Some parapsychologists believe intuitively (because there’s no evidence) that the various abilities involved (ESP, remote viewing, telepathy, precognition etc) are all aspects of one basic attribute. Unfortunately this is as far as it goes for the present, as no-one knows how to even start investigating this idea. It is interesting to note that Clairvoyance was seriously investigated by both the USA and Soviets as a means of espionage or intelligence gathering. It seems obvious that any positive results would, even now, be secret. Governments with this knowledge now would also have a vested interest to play down and discourage any civilian attempt to gain knowledge and repeatability in Clairvoyance of whatever sort. But this applies only if the said governments use it regularly to gain accurate information. The early research was to simply send a person, called a ‘sender’, to a remote randomly chosen spot, where he or she would ‘send’ the information about the location to a ‘receiver’. The ‘receiver’, situated in a ‘control’ building with the scientists, would then write out, sketch or simply speak the information about the remote spot. Next, this information the receivers gleaned from, presumably, the senders, was then judged by separate judges and ‘marked’ according to the accuracy of the information. There were controls throughout the experiments, which were repeated a number of times. The term, ‘remote viewing’ was coined to cover this type of process. The results were positive and accuracies significantly above chance were recorded repeatedly. A further refinement of this technique was to place the ‘receiver’ in a Faraday cage, which did not affect the accuracy of the results. As a Faraday cage eliminates most of the electromagnetic frequencies from the inside of the cage, these could be discounted from being the medium of information transfer. All except extremely low frequency propagation as Faraday cages are not efficient at filtering these out. It’s interesting that Soviet research at that time came to similar conclusions. In another set of experiments the sender was isolated in a visually opaque, electrically and acoustically shielded chamber, hooked up to an electroencephalograph and then stimulated by random strobe light flickers. This showed, for one particular sender that information transfer had occurred. However, this sender reported no difference between that experiment and the previous ones. This particular sender was asked to mark the time when information transfer had taken place, but his results did not match the strobe light flickers. All in all, the researchers were not able to identify how the information was transferred. Once these results were reported, a spate of experiments ensued where other groups tried to duplicate these results. Some limited success was reported here. At present there are various open experiments being conducted on the internet. Mostly they involve Zener cards, the results being collated and analysed statistically. Zener cards (aka ESP cards) were specifically developed by J.B. Rhine in the 1930s. They consist of the symbols circle, square, wavy lines, cross, and star and there are five cards of each in a pack of 25.